A month after Act 39 of 2016 was signed into law by Pennsylvania Governor Wolf, and a few short weeks before the Act and its companion (Act 85 of 2016) went into effect on August 8, the Pennsylvania Liquor Control Board (PLCB) issued guidance on the changes for existing and future alcohol-related licensees under the Act. In particular, the PLCB guidance aims to consolidate the key provisions across Act 39 as they apply to certain types of licensees or categories of activity. The following provides a summary of some of the key changes as interpreted by the PLCB; however, the full summary of Act 39 of 2016 can be found on the PLCB’s website. A major focus of the Act 39 amendments to the Pennsylvania Liquor Code is increasing the availability and promotion of Pennsylvania alcohol products. These changes take two key forms. First, as noted by the PLCB, Pennsylvania limited wineries, limited distilleries and breweries with an accompanying brewery pub license are authorized under the new law to sell each other products as part of the privileges of their own manufacturer’s license without the need to obtain a separate and, in some counties, very expensive restaurant license. Note, however, that while the Act seeks to create equality among the three categories of manufacturers, Pennsylvania breweries, unlike wineries and distilleries, may only avail themselves of this privilege if they have a separate brewery pub license — a provision that is not required for the other two categories of manufacturers. Second, the PLCB notes that Act 39 expands the availability of special “exposition” permits for Pennsylvania cideries, breweries and distilleries, which were previously only available to Pennsylvania limited wineries. Specifically, Pennsylvania cideries and limited distilleries may participate in “alcoholic cider, liquor and food expositions,” which are affairs aimed at educating attendees on the availability, nature and quality of Pennsylvania-produced alcoholic ciders and liquors, together with food displays, demonstrations, musical activities and other cultural events. Pennsylvania breweries, in contrast, have the same ability to obtain exposition permits, but rather than focusing on promoting Pennsylvania-based products, these permits need only promote the availability, nature and quality of malt or brewed beverages more generally. In an effort to bring Pennsylvania cideries closer in line to the treatment of hard cider at the federal level, Act 39 amends the definition of “alcoholic cider” by increasing the maximum alcohol by volume from 5.5 percent to 8.5 percent (the latter being the definition of hard cider for federal excise tax purposes beginning in January 2017). However, the Act and the PLCB guidance note that, because cider is defined as beer under Pennsylvania law, after Act 39 went into effect on August 8, the PLCB can no longer purchase cider to sell in its stores. Accordingly, cider will be sold exclusively alongside beer at retail. In its guidance, the PLCB notes the elimination of the current direct shipper license in favor of a new direct wine shipper (DWS) license. Under the new DWS license, any licensed wine producer (whether in Pennsylvania, another state or another country) may lawfully ship up to 36 cases of wine to Pennsylvania residents within a calendar year for personal use. Unlike the previous law, direct shipments can be made for any wine, not just wine that is not currently available in the PLCB stores. However, all wine purchased directly must be transported to Pennsylvania residents via a Pennsylvania-licensed transporter-for-hire. Indeed, Pennsylvania limited wineries either have to obtain a transporter-for-hire license or ship through a current license holder within the Commonwealth. Of particular interest to Pennsylvania residents and those doing business in the Commonwealth is the Act’s focus on expanding the location and availability of alcohol beyond traditional licensees. For example, the Act codifies the PLCB’s recent (challenged) interpretation that, while the PLCB cannot license a location where gas is sold, it is permissible to authorize interior connections between a lawfully authorized premises and an area where gas is sold. In short, gas stations may now sell alcohol with certain restrictions. Indeed, no provision of Act 39 has gotten more attention than the development of wine expanded permits. For those entities holding a restaurant or hotel license, the new permits allow for the sale of wine to go of up to three liters in a single transaction. This is significant because a growing number of grocery stores have obtained restaurant licenses and developed separate licensed premises to sell alcohol to their patrons. 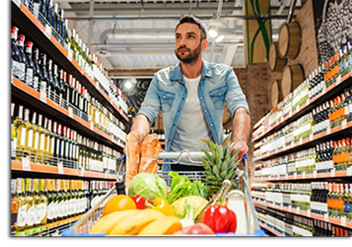 The PLCB noted that the new license includes the ability to purchase non-alcohol items at the separately designated licensed premises, meaning grocery patrons cannot buy alcohol at the normal checkout but can purchase their grocery items at the alcohol-designated registers. Further, to support the expansion of these permits, the PLCB notes that the Act does not allow residents located within 500 feet to protest the issuance of a wine expanded permit. This article was originally published on Pepper Hamilton LLP on July 26, 2016. It was written by Alva C. Mather, Partner of Pepper Hamilton; and is used with permission in Hard Cider News. All other uses, reproduction and distribution, including without limitation reprints or posting on open internet sites, are prohibited. For future use, please obtain permission by Pepper Hamilton LLP. Photos courtesy of Pepper Hamilton LLP. From his comfy chair in St. Louis, MO, working on Wall Street remotely, Brad Genung never thought he would be producing wine and cider. Life is full of curve balls and prior to the market crashing Brad realized that he needed to get out of that particular line of work. Through his work on Wall Street, Brad worked with many clients in the wine industry and started gaining an appreciation for fine wines. In 2001, Brad moved to Cobden, IL. Looking for something stable and sustainable, Brad decided to take over the existing winery Owl Creek Vineyard. 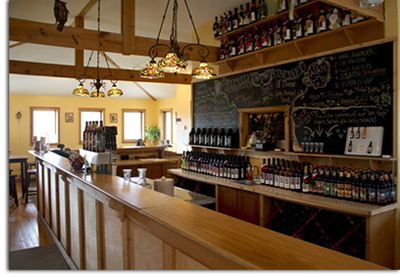 Owl Creek Vineyard began as a grape growing enterprise in 1980 which then later became a winery. A man by the name of Ted Wichmann first founded the vineyard and he became the first commercial winemaker and grower in the Shawnee Hills region of Illinois. Brad took over the vineyard in 2005 and since then, significantly grew production. At the time when Brad took over, Owl Creek was only one of four wineries in the area and it took much trial and error to hone in and perfect his wine making skills. Despite doubts held by some of the locals, his skills sharpened and Owl Creek became an even more successful winery. Through many years of making wine, Brad started to feel the effects of the still evident recession; he knew that it was time to diversify in order to grow. With a thorough understanding of wine making and a local culture of apple growing, he figured he would try his hand at making cider. In the Southern tip of Illinois in the Ozark Mountain area, where the winery was located, it is elevated making it the perfect climate for growing apples. Brad quickly learned that wine making and cider making required vastly different set of skills. He and his team did extensive research before they began narrowing down the ciders they produce today. Brad bought and processed small batches of 14 varieties of local apples, sent away for a variety of UK published cider making tests, and learned from Peter Mitchell through his advanced cider making course at Cornell University. Armed with this knowledge, Brad and his staff were able to focus on which qualities they wanted to have in their ciders and how they would go about accomplishing those profiles. 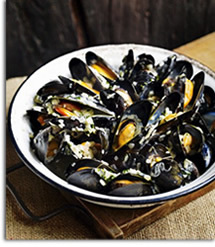 Just as in wine making, Brad went through an exhaustive trial and error period trying to get the recipes just right, about four years to be specific. By 2010, Brad was ready to open his tasting room to the local market; and Apple Knocker cider was born. Brad said that his favorite part of cider making is the amount of freedom he has to experiment and get creative – with wine making there was an emphasis on sticking to traditional methods of production. Brad accepted this creativity challenge with open arms and began experimenting with different methods including barrel aging, smoked ciders, and even exotic add-ins such as hibiscus. Hard Knocks – This cider is barrel fermented using Belgian Trappist yeast, it is then barrel aged in American oak. Since Belgian yeasts express different qualities by varying the temperatures, Brad starts fermentation at 70 degrees then slowly brings the temperature down until it is at its intended static temperature. The cider’s apple characteristics come through in the cider but are also complimented by a unique citrus sour note imparted by the Belgian yeast added. Bad One – This is a semi-dry cider that uses a variety of green apples and champagne yeast during fermentation. The fermentation is then slowed down by bringing the temperature down to around 60 degrees. This cider is a bit tart and a bit sweet with a nice crisp finish that will leave you wanting more. Sweet Knockers – This is a traditional style English cider with an un-traditional name. Jonathan apples along with other bright apple varieties go into this cider. Cold fermentation is also used in this style but care must be taken as this method of slowing fermentation and using this type of yeast can create bacteria and raise acidity in the cider. In the end, if this method is done correctly, it gives the cider a silky mouthfeel which many cider lovers enjoy. Back sweetening with juice puts this cider on the sweeter end but not overpoweringly so. The bright apple characteristics come through cleanly for a fresh apple taste while finishing on an enjoyably slightly acidic note. Brad hopes to continue experimenting with the ciders to create new and innovative flavors. With the exception of the Pumpkin cider, Raspberry cider, and Bourbon barrel aged cider, most of the experimental ciders get released on tap only at the tasting room, so there is no better time than now to go and explore Apple Knocker Hard Cider and the beautiful Shawnee Hills of Southern Illinois. 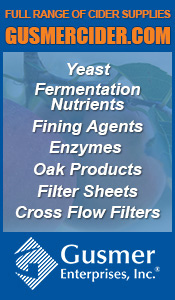 For more information and directions to the cidery, check out AppleKnockerHardCider.com. Photos courtesy of Apple Knocker Hard Cider. Woodchuck Cider – the brand that started the American cider revolution – turned 25 this year, and parent company Vermont Cider Company has marked the milestone with refocused efforts on its core cider styles and an “intimate” gathering for over 7,000 fans known as Ciderstock. Beginning this month, “Chuck” will be making a return to the packaging, advertising and marketing initiatives driving brand recognition and sales growth for the company’s four core styles: Amber, Granny Smith, the new Semi-Dry and a rotating seasonal line. “With the addition of Semi-Dry, the original hard cider brand will have a cider for all consumer palates, from sweet to dry,” Hopper added. Released in 2015, Gumption is a bold and audacious brand which has been wildly successful with consumers. Gumption will now be marketed as its own brand with its own line extensions. 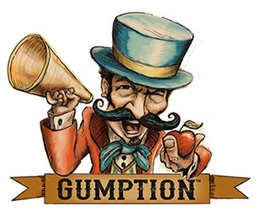 The original Gumption brand – inspired by PT Barnum – will be joined by a second, year-round style, to launch in 2017. In addition, the company will launch the year-round Gumption Late Show six-pack. The package will remain the same, but the liquid will regularly change. Addison will be a year-round core style, available in 12-ounce bottles and 16-ounce cans. Additionally, a barrel-aged line will release seasonal offerings throughout the year. “The Vermont Cider team is exceptionally proud of the heritage and the craftsmanship behind our domestic and imported cider brands,” said Hopper. “The clarity of our new portfolio strategy means we can let our brands be who they are naturally: Woodchuck can thrive as a result of its renewed clarity in the everyday occasion; Gumption will capture consumers looking for new and interesting ciders; Addison will appeal to consumers seeking high-end and regional options; Magners is the second largest cider brand in the world and can compete in the imported segment; and for consumers looking for a west coast lifestyle brand, we have Wyders. To cap off Woodchuck’s 25th Anniversary, Ciderstock delivered an amazing cider-filled day in the field behind the Vermont cidery this month. Top musical acts such as Sublime with Rome and Dirty Heads plus openers Wild Adriatic and Villanelles, performed for a crowd of over 7,000 in attendance. The day-long celebration of all things cider, now in its third year, featured local food vendors, a backyard games area, fireworks, and an educational session on cider firkins – some of the experimental ciders that the Vermont Cider team is playing around with, made just for the event. Kristyn Dolan, Editor of Hard Cider News, had the opportunity to attend Ciderstock and a “Firkin Frenzy” session this year and couldn’t stop talking about the four amazing ciders that Master Cider Maker, John Matson, introduced. One of the ciders sampled during the event was made with Addison County (VT) apples and acted as a preview of what is to come from Vermont Cider’s Addison line in the future. Made with wild yeast, this cider was a real departure from the ciders we have typically tasted from Woodchuck Cider. It was more dry, less sweet, a bit more tart and a great deal delicious! Matson made note that he and the Vermont Cider Company are really thankful for the work the United States Association of Cider Makers and its members did legislatively to change the federal alcohol level restrictions on cider because this cider (along with the other firkin made ciders) sit at around 8% ABV. 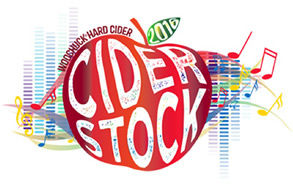 Check out photos from this year’s Ciderstock on the Hard Cider News Facebook page. 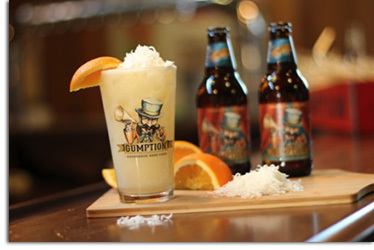 For additional information on Vermont Cider, Woodchuck Cider, Gumption and Addison, please visit Woodchuck.com. Photos courtesy of Vermont Cider Company. 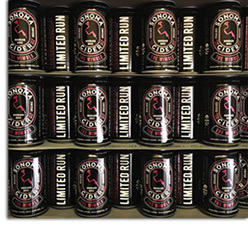 Sonoma Cider, the award-winning producer of such innovative hard ciders as the The Hatchet, The Pitchfork, The Anvil, and The Washboard, added a new limited run flavor to its portfolio, The Wimble, marking the company’s second cider to be available in a can. Launched earlier this year, this cider is a twist on a Gose. Pronounced “gos-uh,” this is an old German-style beer that is traditionally sour and briny due to a blend of coriander and salt with yeast and lactic bacteria. Sonoma’s Wimble has all of those beer characteristics in their cider but with a lingering, and addicting, harmonic tartness from notes of rhubarb and apple. The Wimble is part of Sonoma Cider’s “Limited Run” series, a collection of unique flavors that express the team’s creativity and inventive nature. Organic Pacific Northwest apples from Yakima Valley are combined with organic red rhubarb juice and sea salt to create this cider, complete with a tart acidity and slight saltiness that leaves you wanting more. The flavors of The Wimble make it the perfect complement to Cajun cuisine, BBQ ribs and spicy Thai dishes – and because it is produced in a can, this cider makes the ideal companion for outdoor adventures. The Wimble is currently available in 12-ounce can 4-packs, 5.16 gallon kegs and 15.5 gallon kegs. Alcohol by volume is 5.5%. This cider is the perfect summer refresher so get it while you can before the summer (and this limited cider) are gone for the year. Sonoma Cider offers four, award-winning “Core Ciders” which are available year-round. This includes the signature, apple cider “The Hatchet,” pear-based “The Pitchfork,” bourbon-flavored “The Anvil”, and sarsaparilla-vanilla “The Washboard”. Sonoma Cider also offers additional flavors through their “Limited Run” series and “Cidermaker Reserve” series. For additional information, please visit SonomaCider.com. Photos courtesy of Sonoma Cider. 1. Raspberry Ginger Cider by Eaglemount Winery – Coming in at 8% ABV, this ginger based cider adds fresh raspberries to create a unique spiced cider experience. The cider has a brilliant clarity with a dark amber-ruby color. This is a semi sweet cider with a good spicy ginger flavor and bits of fresh apple showing through, followed by a back note of raspberries. Eaglemount is a winery from Port Townsend, WA, that opened in 2006 and also specializes in ciders made with heirloom apples along with mead. For more information or to learn about their other ciders, check out EaglemountWineAndCider.com. 2. Ginger by Nine Pin Cider – Based out of Albany, NY, Nine Pin Ciderworks is New York’s first farm cidery. Among the many favorite ciders of the company’s patrons is the ginger cider which has a 6.7% ABV. Nine Pin blends a selection of dessert apples with ginger and adds in orange peel for a spicy and aromatic beverage. The ginger comes through strong in this cider giving it a nice kick. It pours a cloudy golden color and finishes with the fiery taste of ginger on the palette. For more information or to learn about their other ciders, visit NinePinCider.com. 3. Fresh Root Ginger Cider by Thistly Cross Cider – Thistly Cross, an East Lothian, Scotland based cidery creates their signature ginger cider by infusing their delicious semi sweet cider with fresh ginger root to give the cider its characteristic heat. This cider is a clear pale yellow and comes in at 4% ABV. The cider is on the sweeter side with very light apple notes due to the ginger being the dominant flavor. The ginger is definitely present but not overly spicy. For more information or to learn about their other ciders, check out ThistlyCrossCider.co.uk. 4. Hibiscus Ginger by Awestruck Ciders – With a 6.8% ABV from Sidney, NY, is Awestruck’s Hibiscus Ginger Cider. It is easy to see from the clear bright pink hue that this is no average cider, the fermented beverage is steeped like tea with hibiscus giving it a vibrant color along with a complex taste on the palette. As if the hibiscus wasn’t enough, the cider is then infused with fresh ginger root blending the two flavors with sweeter apple notes creating a perfect balance of sugar to spice. The cider finishes with most of the hibiscus flavor coming through at the end. For more information or to learn about their other ciders, visit AwestruckCiders.com. 5. Thai Ginger by Locust Cider – Granny Smith and Gala apples are the stars of this 6% ABV cider from Woodinville, WA, while Thai ginger root shines in a supporting role. This cider is a brilliant straw yellow color with bright aromas of spicy ginger right out of the gate. The apple comes through in this semi sweet cider and is met with strong but not overpowering notes of ginger. The cider finishes clean with only a slight mild note of ginger on the tongue in the end. For more information or to learn about their other ciders, check out LocustCider.com. 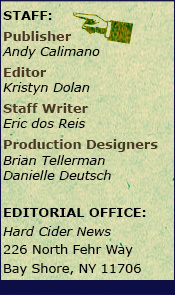 Compiled by: Eric dos Reis, Staff Writer of Hard Cider News. Photos courtesy of the respective cider companies. Live life deliciously… That’s what Blake’s Hard Cider, from Armada (MI), is asking us all to do with their latest seasonal release, Black Phillip. The newest creation from Blake’s has infused blood orange and cranberry with Blake Farms apples into what might be their best cider to date. 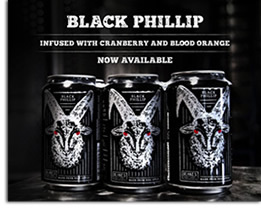 Black Phillip, with an ABV of 4.5%, is currently available to Blake’s Hard Cider distributor partners in Michigan, Ohio, Kentucky, Indiana, Illinois, Wisconsin, North Carolina, and Kansas in 12oz six-pack cans, 22-ounce bottles, 1/6 bbl & 1/2 bbl kegs. Select bottle shops and grocery chains will carry Black Phillip in cans and bottles. For additional information, please visit BlakesHardCider.com. 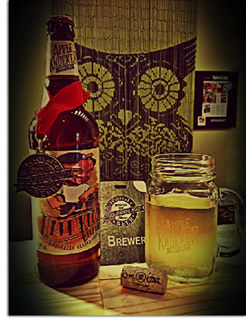 Photos courtesy of Blake’s Hard Cider.